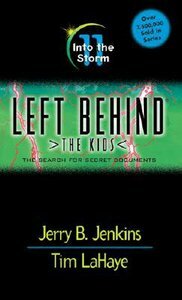 The popular LEFT BEHIND juvenile fiction series follows the stories of four children who have been left behind after the 'Rapture.' With themes and events that parallel the blockbuster adult series, these entertaining books carry LEFT BEHIND'S message of repentance and outreach to a new generation. About "Into the Storm (#11 in Left Behind The Kids Series)"
Over the loss of their friend, the Yound Trib Force hears scary details of the future. As Judd hides, the others must help him find secret documents to combat the Global Community. Lionel faces a life-changing decision. Vicki must deliver the most convincing edition of the Underground yet. Follow Judd, Vicki, Lionel, Ryan, and the growing Young Trib Force as they encounter new dangers and a world crumbling beneath them. The continuing adventures of the four teenagers caught in a world in chaos. After being left behind at the Rapture, they struggle to grow in their newfound faith, live boldly for Christ, and battle for their lives.